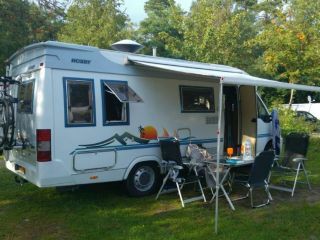 This is a nice camper for 2 to 4 people with possibly. a pet in consultation. 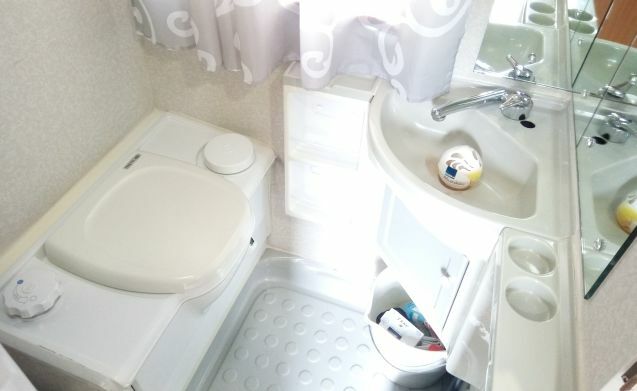 The layout is very convenient, because the toilet and kitchen are placed in the back. The camper has a towbar. The fiat turbo diesel engine is strong and has 115 hp. Auxiliary air suspension is placed on the rear axle for improved road holding. On a diesel tank you can drive 600km if there is normal driving. The co-driver seat is rotatable, and below is the household battery with main switch. 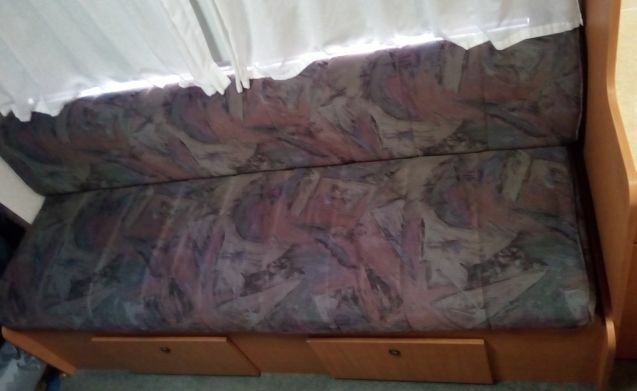 The dinette can be converted into a double bed, and 2 people can be accommodated in the alcove. to sleep. The living room is well equipped with LED lighting which can be dimmed separately, creating a cozy atmosphere. There is a LED TV with DVD and tuner for Sat TV and KPN Digitenne, with which you can view all NL channels. Manually align the dish itself. no sat TV subscription. There can be 100 liters of water in the drinking water tank, and also in the waste water tank. 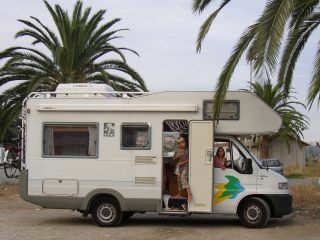 The Camper is equipped with an inventory with which you can help yourself well. There is a large camping table and 2 chairs. 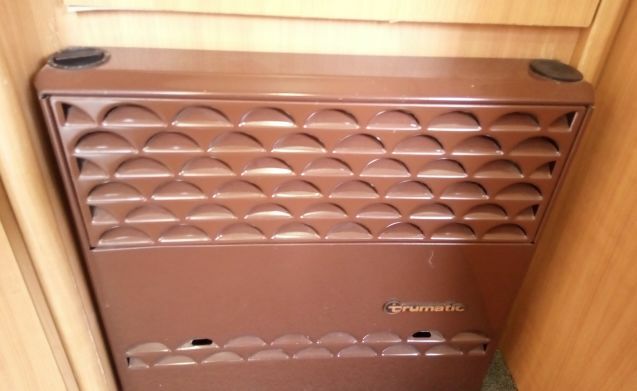 There is a small inverter built in which you can charge small devices. (telephones) at the campsite the 230V can easily be connected. On the bike carrier, if necessary. 3 light bikes. There is plenty of cupboard space so there is plenty to do with it. In the gas cupboard is the gas bottle that is sufficiently full, there is a long power cable and a filling hose and watering can to fill the water tank. also many extras to make camping a pleasant holiday. The acsi books and pass also present, and on the Garmin navigation is a file with camper pitches throughout Europe; it is also available on request. The Camper goes well insured with you, the NKC insurance is the best there is. in consultation we can agree on what does or does not go with your trip. 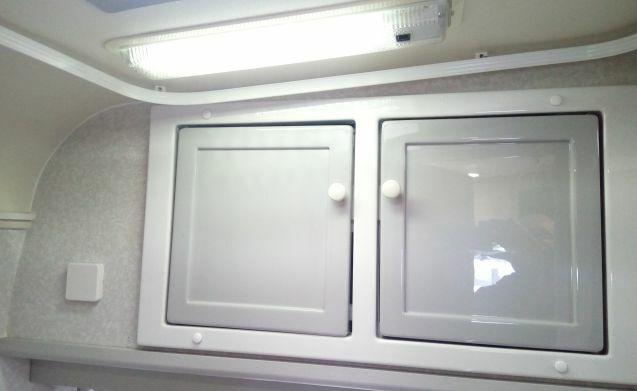 ER has recently been reinvested in the Camper; the distribution has been replaced, 4 new tires and 2 new batteries have been installed, and the side and rear panels have been refurbished all around. We give clean camper with. We assume that you clean the camper again returning. If not, we will charge € 50 cleaning fee. The diesel tank is full of gas before departure and again hand in full. Specify if necessary. defects even by so we can fix it asap. Response from Nico Prettige mensen, en ook weer een goede ervaring met het verhuren. De Camper is bij hen in goede handen. Response from Nico Deze mensen waren ook enthousiast, en ze hebben zelfs een horrengaas vervangen van een dakluik, terwijl dit niet door hen defect was geraakt! 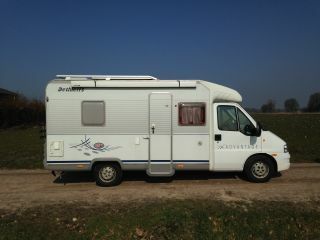 zou ze graag weer de Camper toevertrouwen. Response from Nico Ook deze ervaring is ons bevallen, de camper is netjes volgens afspraak weer terug. Er was een klein "schadepostje" (afwasteiltje kapot) maar dat hebben ze tijdens hun vakantie al vervangen (TOP!). Het is een leuk gezin en betrouwbaar om daar uw camper aan te verhuren. Response from Nico Onze eerste ervaring is goed bevallen, de camper is netjes volgens afspraak weer terug, en bovendien hebben we deze aardige mensen een leuke vakantie bezorgd. U kunt met een gerust hart uw camper aan Petra en Erik verhuren.